The "ci" is pronouned like "sh" in ship with a silent "i", so the name sounds like Lan-sha. No hard C or E and howdoyousaythatword.com has a short audio clip if you need more help. Lancia retained some of its character and own design/production until the 1990s when the lineup changed to use rebadged Fiats. Today most cars wearing the lance and shield logo are (gasp) rebadged Chrysler product. Why anyone would buy a new Lancia when you can pick up a genuine old one for cheap? 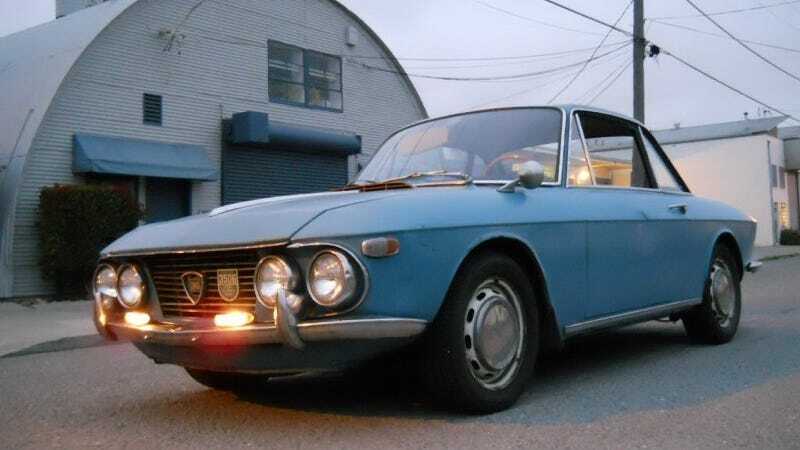 Find this 1967 Lancia Fulvia Coupe for sale in Berkeley, CA for $12,500 via craigslist. Tip from Kaibeezy. In truth a vintage Fulvia isn't a good competitor to a new Chrysler 200 with Lancia emblems - frankly the two are so far apart that it is like comparing a brick of Velveeta to an ounce of parmigiano-reggiano. While both fall under the same general subset (cars and cheese respectively) they each have their purpose. You wouldn't melt Velveeta on a fine parmigiana di melanzane or use parmigiano-reggiano on microwave broccoli. Nor would you attempt to look hip in a new Ypsilon or daily drive a vintage Fulvia. Although the seller of this Fulvia does say he used it for his daily in a thoroughly detailed blog...but most trips involve surprise maintenance. Passengers need to wear shoes suitable for pushing a car. The Fulvia is powered by a 1.3 liter narrow 13 degree V4 that uses two overhead camshafts (one for exhaust valves, one for intake) and a single head (similar to Volkswagen's H2O cooled VR6 setup) to produce 80 to 87 horsepower according to various sources on the interwebs. The engine is leaned over at a 45 degree angle towards the driver's side and mated to a 4-speed gearbox fitted to the front wheels. The Lancia V4 is an interesting piece of engineering and makes decent power for a 1.3 liter '60s engine in a small package. The interior of this Lancia is certainly a highlight - it has an ultra long shifter that protrudes from the floor like a unicorn horn. The George Hamilton skin leather seats match with the medium tone wooden dash and steering wheel. The biggest thing wrong with this car is that the seller admits it has a rusty bottom, but one can only assume that all Fulvias are rusty and this is simply a code phrase to keep non-serious buyers at bay. Originally posted as 10k: Half Empty or Half Fulvia? 1967 Lancia Fulvia Coupe on Daily Turismo.